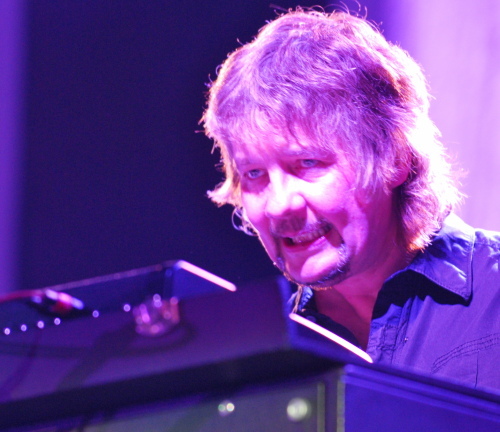 Rockpages.gr has published a recent interview they did with Don Airey. Quite an interesting reading it is, where Don touches upon many things past and present. Rockpages.gr: “Rapture Of The Deep” was released in 2005, Deep Purple are touring constantly, are there any news regarding a new album? Don: I don’t know… they don’t say much. I talked to Roger about it, I am not sure what’s happening… I am sure there will be another album. The trouble you see is the touring commitments. What’s with the band, it’s a touring band, that’s how it exists. It’s a big organization. Sometimes, there are thirty people on the road, so you can understand the financial pressure. I think that the band at the moment is more successful than it’s ever been. Everything is going well, and it’s a real powerhouse! I think it’s back where it belongs, sounding like it should. I went to see Ritchie last year, me and my wife went up to Birmingham to see Blackmore’s Night, and it was great! What a show! I think he’s playing amazing! It’s different… that’s a very thing to do, which is change your act. I believe we caught him on a good night, we could have gone the night before, and it wouldn’t have been so good. But, he did a two hour show, and my wife and I went backstage, and he gave us a wonderful welcome. It was great to see him. We talked for about half an hour, just about Rainbow, and we were talking about Purple. And I said “Ritchie I feel really strange”, he asked why, and I said “well, we’re talking about Purple, and I am in, and you are not! Isn’t the world strange?”, “very strange” he replied (laughs). There’s lots more where it came from. Posted by Nick Soveiko on Wednesday, August 26th, 2009, filed under News. You can follow comment on this post through the RSS 2.0 feed. You can leave a comment below, or trackback from your own site. Don is a gent. Great to hear he’s on good terms with Ritchie and they talked about purple, I would love to hear what they said!! It worrys me that Don doesn’t really know if their is to be a new album. I thought the band was a true 5 way split? It seems not. We really need a new album!!!! Don is part of the band or they meet only for two hours during their shows??!! do they talk sometimes???? Don: I don’t know… they don’t say much. Sounds like Don is a hired gun rather than a fully fledged member of Deep Purple. I might be wrong but who the hell is “they”. Read all interview.Very interesting words of Don comparing Ritchie to Frank Sinatra…Both were giants. Please don’t let “Rapture of the Deep” be this great bands last album…That would be a travesty! He measures the orginization as ‘big’ but 30 people on the road? Huh, the Rolling Stones crew exists of well over 100!!!!!!!!!!!!!!! Quite small when you compare the two, knowing all to well which is the much better band, but perhaps not the better act when numbers like that are concerned. People need to let history take care of itself and quit being so concerned about a new album that will happen sooner or later, not mention rockpages is easily one of the biggest jokes on the net. I don’t know why on earth Don or anybody else would oblige them, but whatever. Don is not DP’s spokesperson, so not commenting till it’s been approved is a good idea.lol! Don spoke to them is that sure to agree upon? I mean, its not made up or something, or is it? after the departure of His Blackness, hehehe, in 1993. Don and Steve never had the equal role in the proceedings as Lord and Blackmore had. I think we can agree upon that? 30 people in the organisation does not seems very much to me. I agree. One of the reason a lot of people are not going anymore are the prices of the tickets. Amsterdam and Antwerpen are about 45 or 47 Euro. Thats a lot of money for a gig , even today. Should I feel sorry for them being poor now? The Band in terms of control may not be equal or necessarily be pointed in exactly the right direction………but instead of hurtling into oblivion with Blackmore at the helm, the band has continued to this day…………so I guess somethings are working ok. I would guess that Don & the other guys are to some degree, operating at the behest of Accountants & Management who are keen to capitalise on the current demand for Live Deep Purple. No, I’m not saying that it’s business before Art, but there are many considerations – you can lose a really good Lighting engineer or FOH Soundman etc. if you are off the road for too long. I would love to hear new albums that had room for a complete reworking of one song from each previous release (Maybe spread over the next three studio albums?) Maybe along the lines of the ‘Jazz’ version of Smoke on the Water – Great fun! Imagine ‘Anyone’s Daughter’ as a Full on Rocker! or ‘Wring that Neck’ with Vocals! Let us admit, there is all time someone who is in charge – when DP was on the top that was Ritchie (creatively and from the point of leading) and Jon with him, in 80s that was Ritchie just he’s became moody later on, and today that’s Gillan and Roger – sometimes I feel sorry for Morse and Airey, it’s sad not to be able to protest but just to point on “them”. Rockpages.gr: What keeps a band going all those years? Money comes first for them??? I bet Ian Gillan hasn’t read this interview or he would retire Don. If you ask Ian, Rog, or Lord, they allways answered that inspiration, love of music, love of each other and love of fans keeps Deep Purple going… and Don said that it is MONEY that keeps them going. what a SHAME! Man, that’s not absurd – this DP, Ian Gillan’s DP is all about another dollar. When Ritchie was in charge all sort of bad things were happening, but you use to have some very distinctive musical approaches. Even when JLT was singer, some of the riffs and musical concepts are out of this world – mixture of the Byzantine, classic and r’n’r music. Today we have so much “love” and nothing else – just words how bad was that Blackmore (well maybe he is bad tempered and moody person to that point, but still his riffs doing a trick), or that’s just pretending so extra dollar can be taken. Nothing exciting and distinctive any more. Hopefully they’ll retire and not record a new album. I love DP since I was 12yo, but this just isn’t that band any more. My humble opinion, I’m sorry if I’m hurting anyone. You are not hurting anyone. DP already did that for ya…. Hmmm. 40 plus years of a band with many line-up changes. I believe it is fairly obvious there would be a constant changing of the guard related to who is in charge…. Yes, Morse and Airey are the newest additions to the fold. Airey the newest of the two. To not expect the Front Man (Gillan) to take the lead role after all these years would be totally ignorant. Someone has to take the lead and usually the strongest character does just that. That is why there was so much strife when Blackmore was in the band. Both he and Gillan were in pure competition regarding who was in charge. With Blackmore gone…..and the rest being quite passive regarding ‘who runs the show’, it only stands to reason that Gillan would take the helm. I’ve spoken to all 5 present members of Purple and Lord also before he left. They all pretty much stand aside and allow ONE to lead the band. Though I will admit, the expression of ‘them’ from Airey is purely leaving yourself to be viewed up as the ‘outsider’, he has pretty much always been a Session Player to the Big Names and not really ever been counted as a Band member. Ozzy, Rainbow, Whitesnake, Gary Moore, MSG, etc. All big names with a not very publicized Keyboard player…..Don Airey. He seems to accept that and therefore hasn’t taken any ranking stand in his present band..Deep Purple, other than just the Keyboard player in the band as apposed to the 5th member…. As far as the Money issue….say what you want, but they are Professional Musicians whom are compensated for their efforts. It’s their job. That is where they get their financial stability from. They are not late teenagers, having a blast, playing music, and banging chics for grins. They are True Professionals whom are well seasoned and do a great job playing and capitalizing at the same time. To discredit any of them at this point of their career for not putting a dollar sign in the equation, you are living some sort of mindless fantasy…. I sure hope they do another album (hell 5 more even better) and open up the spread of each member for their creative push and do a broad based collaboration full of Purple Magic and harder core than the last two. I liked the direction of Bananas and Rapture of the Deep, but they were both missing the harder edge which I believe if brought back, would please the masses. You will find, that if you pull 6 of your favorite tracks from each and blend them together in proper order and make one CD, that it stands up to anything they have done. That’s the difference. Where in the past, there were very few what I call ‘filler tracks’ on their records, the last two albums have about 1 third filler tracks. One factor that leads to this equation is the fact that today, they try and fill a CD which is 74 minutes with 12 or more tracks while back in their heyday, Albums were around 40 minutes long with around 8 songs on them. Can you imagine them putting out a 7 or 8 song, 40 minute album today? I think they call those ‘Maxi Singles’ don’t they? It’s OK for them to earn money, but in my opinion money is the only reason – I disagree that there is any true creativity left in this band. This is less purple Deep Purple. To say money is “the only reason” is just wrong! These guys would just retire if it was only about money, I’m not stupid enough to think $$$ is not a large factor but “the only reason”??? No, not hardly! I beg to differ there! Get over it and find something you enjoy and talk about that instead of crusading against them. Hey, there’s a thought, a positive one at that. The funniest thing is that it tends to come from some that appear to not even be reading the blog before posting in it. Are we about statements concerning the topic, or comprehensive banter? Come on…. Oops, I should have replied to this first. Before you speak, scour that website and you’ll likely agree that their angle is tabloid trash at best. They’re always trying to stir up crap as if it were important. They’re absolutely scandelous! Poor angles galore. Don doesn’t do too bad at being put on the spot, but good thoughtful questioning always gets better answers. Greets from The Stranger In Us All…. Thank you Tracey and Crimson for your common sense and positive comments. Please support Deep Purple, warts n’ all. Surely we can keep the negativity to ourselves. With a band with such a long and varied lifespan, it stands to reason that we won’t like every style or incarnation. I never fully cared for the Bolin era or Turner era but I can recognise the talent, commitment and effort on show. I still listen to those albums and collect their solo stuff also. In fact recently, I have come to really enjoy Bolin’s non Purple material. Stop bitching and moaning. Too soon the curtain will come down for the final time on Deep Purple (whatever its make-up).